One of the reasons I have mad respect for Gardein is because they make it possible to have plant-based Asian food right at home. Sweet and Sour pork used to be one of my favorite Chinese food dishes, and now I can enjoy that dish without involving any pigs. I'm down with the plant-based meats. To be honest, I was a little skeptical of these Sweet and Sour Porkless Bites at first because looking at the picture on the bag they look puffy like the Gardein Home Style Beefless Tips which is not in my top faves. As soon as I took a bite of the cooked Porkless Bites, all that skepticism disappeared. 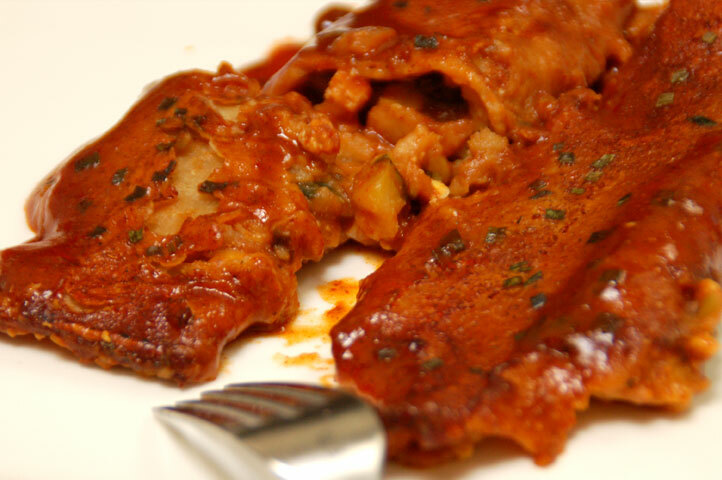 These Porkless Bites are a fabulous way to transition from eating real pork. For a plant-based version of sweet and sour pork, these bites are pretty darn delish and they have 13g of protein per serving which is awesome! The Porkless Bites are best when you pan fry them in some oil so you get that nice crispy outside similar to the crispy outside you get when ordering real pork sweet and sour at a Chinese restaurant. I love that crispiness! I use avocado oil for pan frying. Speaking of Chinese restaurants, I added some sauteed carrots, onions, and red pepper to my Sweet and Sour Porkless Bites to make it look restaurant style. So good! The sauce comes in a separate packet so if you do not like the sauce that comes with the bites or you want to try another sauce like an orange sauce or Peking sauce, you can totally do that. Awhile back, I got really excited about hummus in a tube, and now I am very excited about sorbet in a tube from Jolly Llama. I was buying ice cream for mom and sis-in-law's birthday party, and looking for non-cow milk ice cream I could eat. I stumbled upon this Jolly Llama sorbet and of course had to buy one because well you know me, I find food in a tube highly amusing and if it's not loaded with artificial ingredients well that's pretty outstanding. I tried out the strawberry flavor and wow this stuff is awesome tasting, and the way it slides right out of the tube into your mouth as you squeeze on the bottom is pretty cool. This sorbet in a tube is a total Noshtopia snack because it contains no artificial ingredients, and has 80 calories per tube with 0g of fat. It does have 18g of sugars which is pushing it with our desire to wean down our daily sugar consumption down to the American Heart Association's recommended dose of 25g/day. But for a fun, small portion sweet snack, I'm all for this dessert in a tube. You must try it! Doesn't that just look dee-lish-ious! What you probably would never have guessed is that the Coconut Chocolate Chip Cookies are vegan made by Fabe's All Natural Bakery brand, and the Mint Chip ice cream is the Tempt brand made from hemp milk by Living Harvest. Yes, that's right hemp milk. Now before some of you click away and go ewww like I almost did when I first heard of hemp milk ice cream, listen for a second because it really is inviting, and I'll tell you why. The taste buds don't lie, at least mine don't, and frankly they are ruler of my eating universe. I'm not going to let a dairy & egg allergy stop me from enjoying food. We just get creative and more open minded. Now, my first thought of this hemp milk ice cream was, "Is this going to taste like chocolate chips and mint mixed in some grassy tasting frozen ice." Yes, kinda judgmental and more so because most hemp milks I have tried in the past have a grassy taste and visions of dancing hippies pop into my head. I'm not saying it's right, I'm just saying that's some imagery that I associate with hemp. I doubt I'm not alone. Pal @jenmyronuk swears that the hemp milk Mint Chip ice cream is awesome so I am open minded. We were in search of dessert after our fabulous salmon and chicken dinner at My Florist Cafe. Initially, we ventured over to Whole Foods on Mayo Blvd because I told her that they could make lattes with rice, hemp, almond or coconut milk. I can't tell you how excited I was of this milk discovery because usually the only milk choices you get in a cafe is what percentage of fat you want in a cow milk or soy. As we walk past the bakery in Whole Foods, we see stacks of various Fabe's vegan cookies, and light bulb goes off. How about crumbling some cookies in the ice cream. The ice cream is in a plastic cup because we decided to stay at Whole Foods and eat our dessert there along with our coconut milk lattes. No grassy taste at all - very crucial. Very nice refreshing after taste from the mint. Regardless if it's cow milk or whatever milk, you want a nice subtle minty aftertaste with Mint Chip ice cream, and this Tempt haz it. Delicious. Again, no matter what something is made of, if it tastes good and has good texture, then I'm a happy camper. Texture wise, to me, I would compare this hemp milk ice cream to an ice cream made with a non-fat to 1% cow milk, so it's on the lighter side. Would I get this Tempt Mint Chip hemp milk ice cream again? Most definitely! And now, I want to try the other flavors. Have you tried any of the other Tempt ice cream flavors, and what did you think? Being a bootstrapping entrepreneur during tough economic times means that frozen meals start looking pretty darn good. But again, I still would like to eat as healthy as possible so I bought this Kashi Lemongrass Coconut Chicken entree as it has no artificial ingredients, preservatives, and wait for it...is only minimally processed. I think the wording of that statement is pretty funny. It's like saying, "this dish is only a wee bit processed-ish." Ideally, it's optimal to eliminate all processed foods from your eating but I'm realistic and once in awhile especially when it's only mini-me processed is fine. Plus, I like the Kashi brand. So far, every product I have tried of theirs has been enjoyable. I dig their cereals. What really turned me on about this Kashi Lemongrass Coconut Chicken meal was the fact that it has Red Quinoa Pilaf. Quinoa is one of my favorites as it is packed with protein for a carb. This single serving meal has 18g of protein which is good. Here is the rest of the nutritional information. Overall, the dish was pretty good for a frozen meal. I wouldn't say it knocked my socks off, but I would buy it again. The coconut lemongrass sauce was a bit heavy on the creamy side for my liking and kind of drowned the grain but I just happened to have some extra Jasmine rice from the previous nights dinner, so I threw some in to sop up the excess sauce. The chicken looked nothing like the long strips on the box, as you can see in the picture above. However, the chicken was moist and not rubbery like it can get in frozen meals. The sugar snap peas were also a bit on the wee side compared to the box shot, but again, we know that all frozen foods never look like their cover shots. It's okay, we still ate and were happy campers. Have you tried this Kashi Lemongrass Coconut Chicken meal? What did you think? I've been eating frozen foods a bit more lately, well because, they're cheap. With everyone buckling down on the finances, I gather I'm not alone. However, just because something is cheap doesn't mean that I am also going to lower my quality standards. This girl wants it all, high quality food at low prices. It's a high bar but lucky for all of us, there are plenty of choices like these Amy's Black Bean Enchiladas which are wait for it...non-dairy, gluten free, cholesterol free, GMO free, vegan friendly, Pareve certified, and loaded with a bunch of organic ingredients. 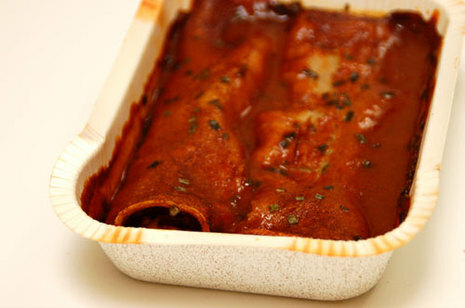 Best part is that these black bean vegetable enchiladas are really delicious. I got a second box. Who knew frozen, non-dairy, gluten free Mexican could be so tasty. In fact, there was enough creaminess in these enchiladas that I hardly noticed that cheese was missing. Gooey cheese is typical of a regular enchilada experience, and in the Amy's case, the dish was good without cheese which I found surprising actually. Here's what the enchiladas look like in the container right out of the oven. I cooked these puppies in the oven because I had time and I've been making an effort to nuke less food. I kinda like the burnt edges you get with baking that you can't get with microwaving. I definitely give these Amy's enchiladas two thumbs up. Here's all the nutritional information, and a product locator.